[By Nick] With my recent move away from the middle of nowhere, I now find myself with a lot of awesome food places within a reasonable distance. 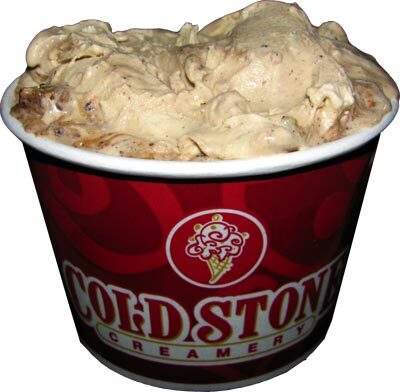 For example, Cold Stone Creamery. Now I've been to Coldstone a few times in my life and I know all about making my own combination of stuff. Seeing as a lot of people opt to just go with one of their Signature Creations, I thought why not start reviewing them for the site? I mean a lot of them sound awesome but the one that stood out to me the most was their Mudpie Mojo. As you can see, I ordered the largest size they offer. Don't worry though, I did have someone to split it with. Seeing as the store was packed‎, we headed back to my car to enjoy the creation. Now a lot of the components of this one make sense. There are countless amounts of mocha almond fudge flavors on the market. Both Friendly's and Hood released their own takes on Coffee C&C flavors not too long ago either. What caught my eye was the fact they added peanut butter to the mix! I've always wondered if peanut butter and coffee went together but the lack of actual peanut butter coffees at national chains made me think otherwise. Heck, most places don't even offer any type of peanut butter baked good to go along with your cup of Joe. If anything, this will certainly be a unique experience. First off, Coldstone makes a very good coffee base. While it might be a little too on the milky side for some, it still retains a fair amount of the coffee's original robustness. 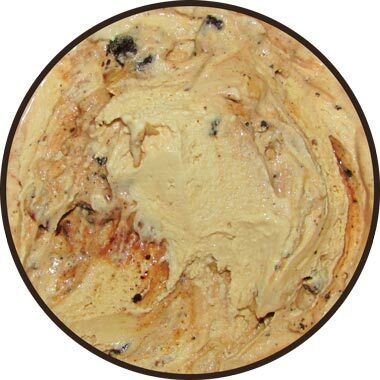 Since the Oreos were freshly crushed, ‎their flavor was pretty strong and added a nice, crispy crunch to the ice cream base. The bitterness from the oreo wafers combined with the fudge also helped to temper the sweetness of the base. The almonds were your typical affair. Fresh, crunchy and they added an overall nuttiness to the flavor profile. What stole the show and took me by surprise was just how well the peanut butter went with the coffee base. It was as if they were meant for one another. The combination now makes a lot more sense to me because you're getting the roasted qualities from both the peanut butter and the coffee and they compliment each other perfectly. The saltiness works well with the sweet, milk coffee base and now I want to see more companies use this combination. It just works so well here that I can't see why it's not a popular combination already. I already know I'll be making sundaes featuring coffee and peanut butter in the near future. The only problem I have and my friend noted was that the fudge didn't really play much of a role in the overall product. We couldn't notice it's flavor all that much with the Oreos and it didn't add anything textually. If I was to have customized it, I would just opt for another oreo cookie and to exclude the fudge completely. That said, this is a signature creation I could see myself ordering again! I've wondered for a while what coffee ice cream would taste like with peanut butter cups mixed in. I suppose the verdict is in! This is a very old post, but just now seeing it. Try this with brownie instead of the almonds, FANTASTIC!! !